Trying to find the best mattress shop in Nashville for one of the most important purchases you can make? You might start off by checking out reviews of the top mattress brands, and maybe even consider an online purchase (all great mattress companies offer a generous return policy). If you’d rather buy locally in person, then check out our guide below for help in making your choice about where to buy for the best deals. The health benefits of a good night’s sleep are well-established: weight loss, muscle recovery, reduced pain, even longer life expectancy. And everyone’s personal experience bears out the benefits to mood, job performance and even the skin’s appearance that a good night’s sleep brings. Research by the Better Sleep Council shows that switching to a new mattress improves sleep quality while reducing symptoms of stress and back pain. Mattresses are meant to be replaced every 8 years or so, though most Americans hang on to their old ones for around ten years. With a fresh, high-quality mattress, however, you’ll fall asleep faster, stay asleep longer, and spend more time in restful REM sleep. If you’re a Nashville resident in the market for a new model, you may want to know where to buy a mattress in Nashville? There are luxury mattress stores with luxurious high-end comfort models. There are mattress stores that carry in all-natural and chemical-free products. And there are plenty of discount mattress shops that specialize in affordable mattresses. So which is best- and most convenient- for you? Rest easy- we’ve got you covered. 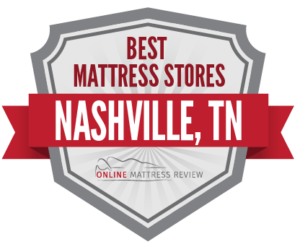 We’ve searched the reviews and listings for mattress stores in Nashville to bring you the top-rated options in each area. Read up to discover where to find the mattress of your dreams, and get started on the road to better rest and better health. Downtown Nashville is packed with attractions, stores, restaurants, and venues. With so much commerce and entertainment, space is at a premium, and there’s not much room for mattress shops in Central Nashville. One option in the area is Mattress Firm Nashville Vanderbilt (3009 West End Ave). The store is located close to the university, making it a good option for students, and averages 5 stars on Google. Mattress Firm is the nation’s leading mattress store chain, and carries a wide array of top brands, such as Simmons, Serta, and BeautyRest. The store’s highly knowledgeable staff of “sleep experts” are trained to resolve sleep problems (such as snoring, back pain and overheating) by connecting customers to specialty beds that suit their sleep style, comfort preferences and health concerns. Mattress Firm also has a 120-day “sleep happy” guarantee. During this period, mattresses may be exchanged or returned, and if a customer finds the same product at a lower price, Mattress Firm will refund the difference. 1st Chance Mattresses and More (3245 Gallatin Pike) stocks highly affordable mattresses in a variety of models, from innerspring to gel memory, along with traditional and adjustable beds. This unassuming but friendly local store also sells new and gently used furniture, making this a good choice for those furnishing a new home. Shoppers looking for a luxury mattress in North Nashville should head to Jameson Bedding (565 Brick Church Park Dr). This illustrious company has been creating handcrafted mattresses and bedding since 1883, and commercial alliances with Intercontinental Hotels and Choice Hotels. Jameson Bedding sells a number of high-end specialty mattresses, including Interacting Smart Coil, JGel Memory Foam, All-Natural Talalay Latex, Palladian Smart Micro-Coil, and Verticoil. The company’s Paradise Collection is an especially attractive option for customers who have trouble sleeping in the Nashville heat; each mattress features cooling gel-infused Visco memory foam. The regional chain, Mattress King has locations in the One Hundred Oaks (718 Thompson Ln), and Berry Hill (708 Thompson Ln) neighborhoods. This store has a five-star Google and Yelp rating and was the 2017 winner of the First Tennessee Reader’s Choice Awards for “Best Mattress Store in Middle Tennessee.” Reviewers give high praise all around for the staff, selection and prices, including Mattress King’s low-price guarantee. The shop carries a variety of models from Simmons and Serta in-store, and also ships a Wellsville bed-in-a-box. The company also stocks mattress pads, bases and pillows as well. Another popular place to buy a mattress in South Nashville is Mark’s Mattress Outlet (3613 Nolensville Pike) in the Rivergate neighborhood. This mattress shop specializes in discounts- up to 80% off retail- and offers same-day delivery. Mark’s stocks popular name brands at wholesale prices, and also manufactures their own line of all-natural and affordable mattresses, Mark’s Naturals. Farther South, on the Antioch border, family-owned Mattress Express (2412 Antioch Pike) has earned a 4.6-star review average on Google. This mattress shop earns high praise for world-class customer service and highly knowledgeable sales staff, who patiently assist customers without exerting sales pressure. Another reliable option is national chain, Mattress Firm, which has a location in the Green Hills neighborhood (3909 Hillsboro Pike). Shoppers that are not set on a specific model of mattress can score a bargain on closeout inventory at the Sleep Outfitters Clearance Center (2405 Lebanon Pike) in the Merry Oaks Shopping Center. Reviewers appreciate the helpful and professional sales staff, who work within each shopper’s budget without ever applying sales pressure. Sleep Outfitters carries beds and bedding, as well as a range of top mattress brands, such as Sterns and Foster, Tempur-Pedic, Sealy and Comfort Revolution. Because clearance stock changes frequently, the inventory on hand can vary, but regularly features deep discounts on top-of-the-line mattresses. Out past the airport, Sleep Number (157 Opry Mills Dr) stocks adjustable-comfort mattresses, which are especially well-suited for those with back pain, or those whose sleep partner prefers a different level of support. There are a surprising number of Mattress Firm locations in West Nashville: Mattress Firm Belle Meade (4309 Harding Pike), Mattress Firm Clearance (21 White Bridge Rd), Mattress Firm Hillwood (6706 Charlotte Pike), and Mattress Firm Nashville West (6800 Charlotte Pike). Each of these store earns great reviews from customers for their wide selection and highly knowledgeable staff of “sleep experts.” Local, family-owned chain, Mattress King, also has a location in the Belle Mead (103 White Bridge Pike) and Bellevue (7114 Hwy 70 S) neighborhoods, and gets positive reviews for affordable prices. The store offers free delivery on all purchases over $499, and promises to beat any competitor’s price or the purchased mattress is free.